At Smylies, we connect countries worldwide with the best British brands on the market, and now we can supply your business with the leading snack brand, Propercorn! Producing a delicious range of popcorn flavours, Propercorn are a healthy alternative to any other popcorn brand on the market, which is why we are proud to be one of the exclusive Propercorn exporters. In our latest post, discover why Propercorn has become a popular snack brand in the UK and how you can order their range of unique flavours with Smylies! Launched in 2011, Propercorn became one of the UK’s fastest growing popcorn brands, fitting a gap in the market for a premium, everyday popcorn snack. To create a popcorn like no other, entrepreneurs Cassanadra Stavrou and Ryan Kohn dedicated their time to sourcing the best quality corn and incorporating delicious ingredients, which led them to dominate the ever-growing snack food market. Known for their unique flavours and being a healthy alternative to regular snacks, Propercorn is now the UK’s 2nd best selling popcorn with the brand continuing to grow. So, what makes Propercorn so special? 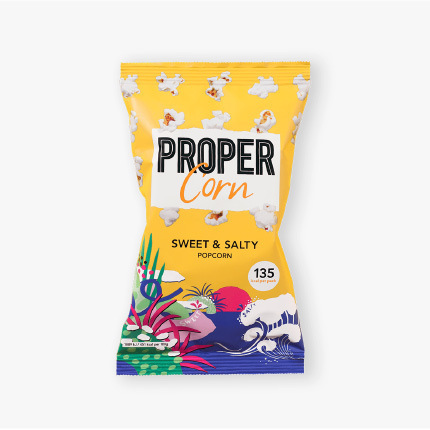 Making their delicious popcorn on British soil, Propercorn produce recipes with under 136 kcals in every serving, making it the perfect treat for those with sweet-tooth cravings! Across the three distinct ranges; popcorn, microwave and kids, nutritional value is at the core of their ingredients. Their low-calorie count delivers on taste and health, whilst providing a delicious snack option to those looking for gluten-free and vegetarian popcorn. Popped to perfection, the distinctively light and crunchy texture is down to their butterfly corn, whilst natural seasonings are used to ensure every pack has a delicious depth of flavour. Seasonings include everything from the traditional sweet and salty and lightly sea salted, to the unique combinations of sour cream and black pepper, Worcester and sundried tomato, coconut and vanilla and even chocolate! Not only do they provide exclusive popcorn flavourings across their ranges, but Propercorn packaging is created by artists and designers from all over the world to design abstract, custom-made illustrations. Inspired by cartoons, comic books, fashion and more, and combined with a trademark bright colour aesthetic, Propercorn really is one of a kind! Shop Propercorn popcorn with Smylies. Smylies export Propercorn popcorn worldwide! No matter whether you’re a retail group, supermarket, distributor or independent business, Smylies export Propercorn products to businesses across the world. So, if you’re interested in stocking Propercorn, start your order by visiting the Smylies shop today. You will find an abundance of produce from leading brands ready for export, whilst having access to price quotes, promotions and important product information. If you have any questions, call us directly on +44 (0) 151 653 3335 or if you can’t talk right now then feel free to contact us online and we will get back to you.